Blue Apron’s core product is a meal experience that customers create using the original recipes and fresh, seasonal ingredients that are included in every box. All recipes are accompanied by printed and digital content, including how‑to instructions and stories of suppliers and specialty ingredients. Blue Apron also sells wine, which can be paired with its meals, as well as a curated selection of cooking tools, utensils, and pantry items, which are tested and recommended by Blue Apron’s culinary team. 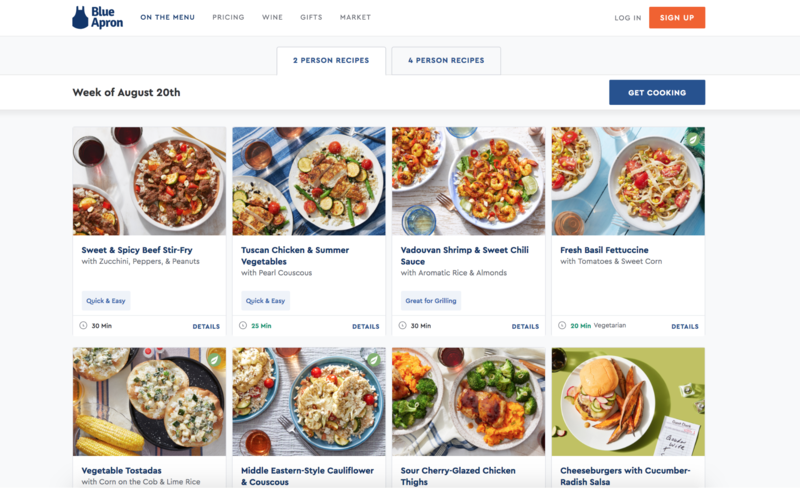 In order to take advantage of this insight, the team conducted a full refresh of the Recipes page to include sign-up CTAs and display even more recipes for consumers to peruse and gain a better understanding of the Blue Apron meal experience. Using Amplitude, the team learned that its Recipe page was an important component of the digital experience that could help attract new consumers to its product. Making the upcoming recipes more prominent on the page has helped improve conversion by 5.5%. 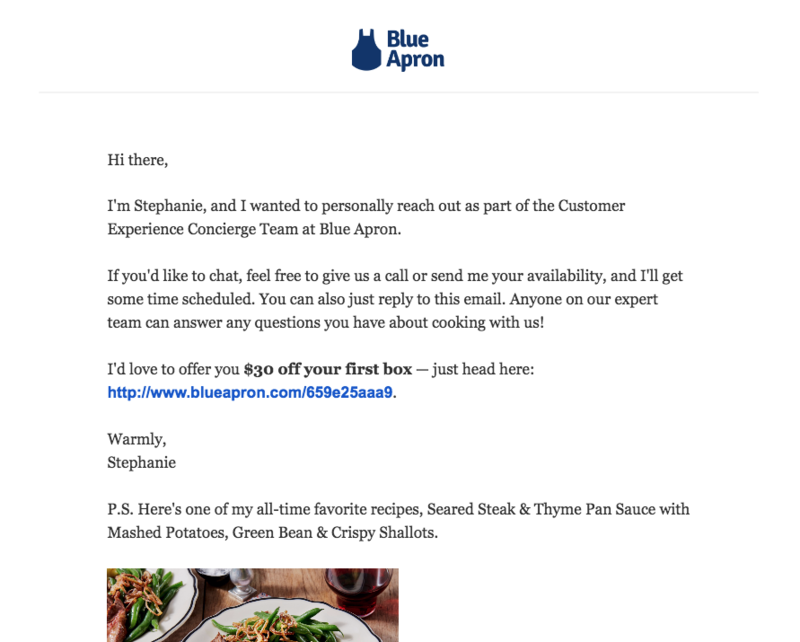 During a review of the abandoned cart experience, the team saw an opportunity to improve how Blue Apron contacted consumers who expressed intent to purchase a meal (i.e. left the product in their online shopping cart), with a more personalized approach. As part of updating the design, the team hypothesized that customers who received a personal email, sent on behalf of a member of the Customer Experience team, would be more likely to try the product. The team conducted an experiment to study whether sending these customers a personalized email—one that introduced the Customer Experience team, offered several options to speak directly to an expert on the team, and highlighted a favorite recipe—would help improve conversion. After testing the personalized email using Optimizely Full Stack, the team saw a 7% increase in conversion. Using Amplitude, Blue Apron learned that their recipe pages were a great way to acquire new users. Making these more prominent has helped improve conversion by 5.5%. 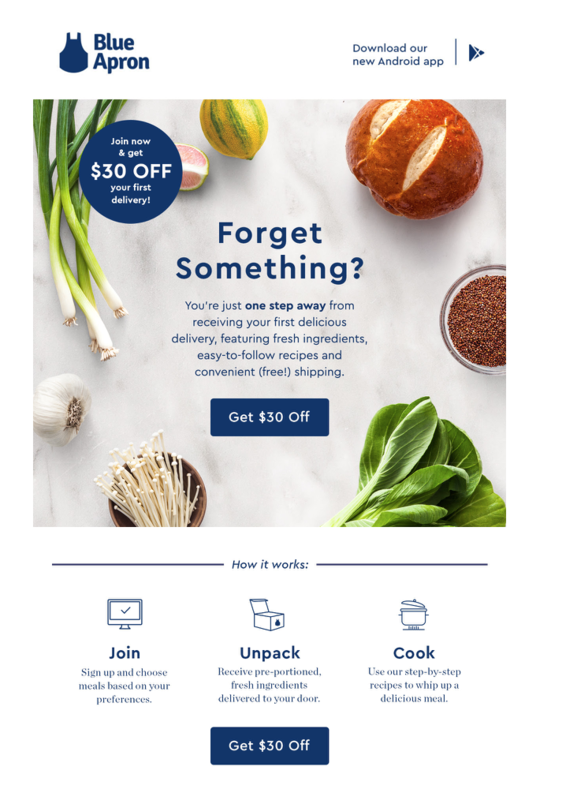 Using Optimizely, Blue Apron was able to test a personalized email to consumers who expressed intent to purchase Blue Apron that improved conversion by 7%. 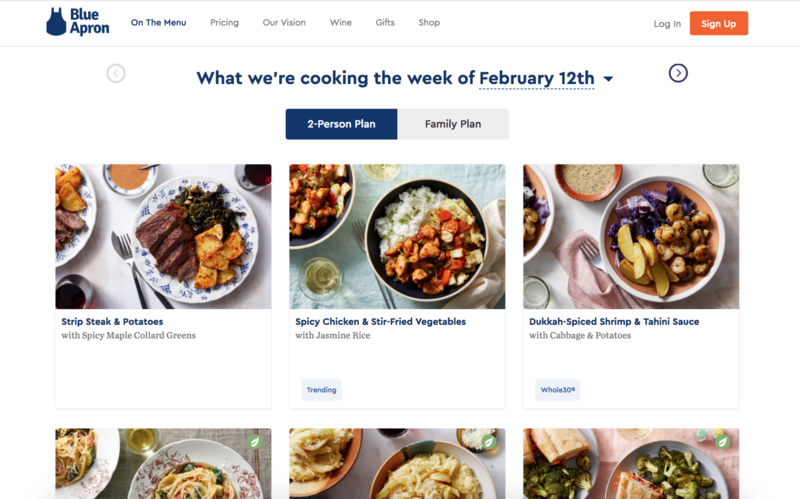 The primary focus of Blue Apron’s Growth team is to build and consistently refine a digital experience that attracts new consumers and deepens engagement with current customers. The Blue Apron Growth team needed a tool to quickly generate hypotheses about how consumers were behaving on the digital platform and run experiments on those hypotheses.